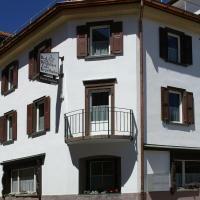 Featuring a bowling alley and a sun terrace, the family-run Hotel Cualmet is set in the centre of Lenz. The Lenzerheide Ski Area is 3 km away. Housed in a renovated building dating from 1890, the Cualmet Hotel provides a vending machine with drinks and snacks. Breakfast is served every morning. The elegant rooms have a sleek design and come with hardwood floors, a flat-screen satellite TV, and a tiled bathroom with a shower or bath. Free outdoor parking is provided, and guests can also park in the garage at a surcharge. The Cualmet is a 2-minute walk from the local bus stop. Thunis is 15 km away, while Chur is 25 km from the property. Ferienwohnung Cualmet is located in a building featuring a sun terrace with panoramic views of the surrounding mountains and the village of Lenz. The Lenzerheide Ski Area is 3 km away. The provided apartment is fitted with modern furnishings, a flat-screen satellite TV and a fireplace. The large living room comes with a sofa and the kitchen features a fridge. Cualmet’s bathroom provides a bathtub, shower facilities and free toiletries. Free Wi-Fi is available in the apartment. The family-run apartment house offers vending machines and a ski storage room. A café, a small shop providing homemade products, and a beauty and wellness shop are all located on the ground floor of the Cualmet building. You can park your car free of charge in front of the apartment house. Garage parking is available against a surcharge and the closest bus station is a 2-minute walk away. Chur is 25 km away and Thusis can be reached within 20 minutes by car. In the centre of Lenz, Hotel Restaurant La Tgoma features an in-house restaurant serving up French dishes and buffet breakfast. Rooms contain a flat-screen TV and mountain views. Free parking is available, and it is 150 metres from the Lenz Bus Stop. Lenzerheide is 5 km away, and the Savognin Ski Resort is 20 km away.